Sarah Menzies is an Australian cat lady with a huge heart. Earlier this year, she formed Cat Tee Mission, through which she she designs and sells t-shirts that look great, raise money for international cat rescue organizations, and help spread the word about animal welfare and the plight of homeless kitties. In August, Sarah fulfilled her lifelong dream of visiting Harnas Wildlife Foundation in Namibia for a two-week VolunTourism trip. 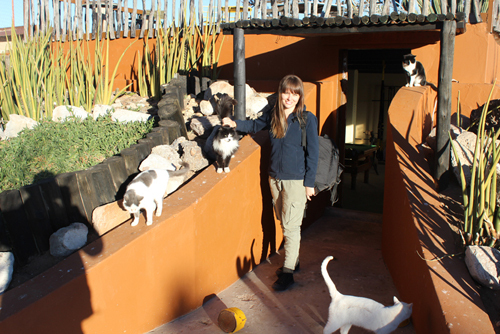 During her stay, she met and worked with cats of all shapes and sizes, and was kind enough to share her once-in-a-lifetime experience with us! 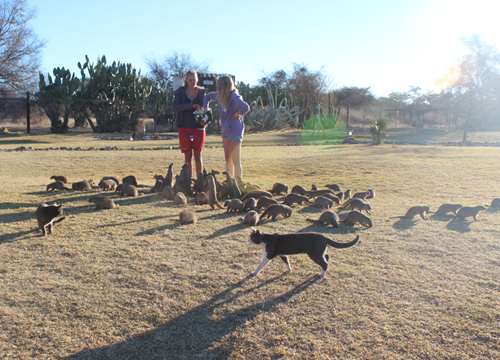 We went to Namibia to volunteer on a wildlife sanctuary with injured, abused and orphaned African wildlife. The trip of a lifetime! 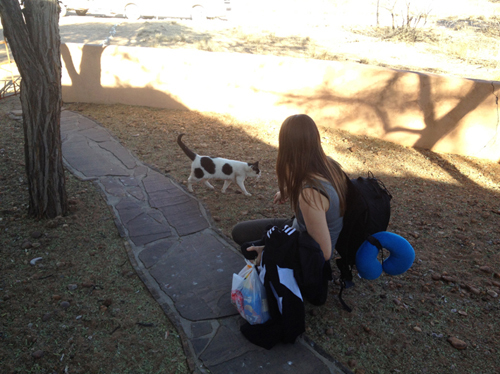 However, I was also excited to know there were domestic cats that called the sanctuary home, too. Over 20 of them to be exact. 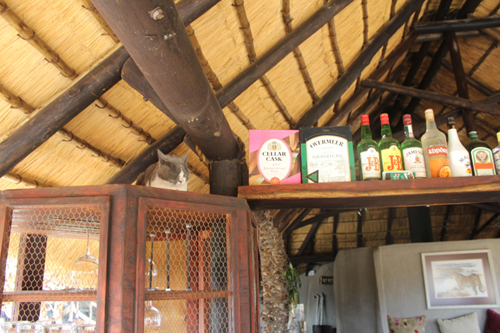 And when we arrived at our lodge, before we even got through the door, we were greeted with our very own live in cat! We didn't know his name, so we called him Spot. 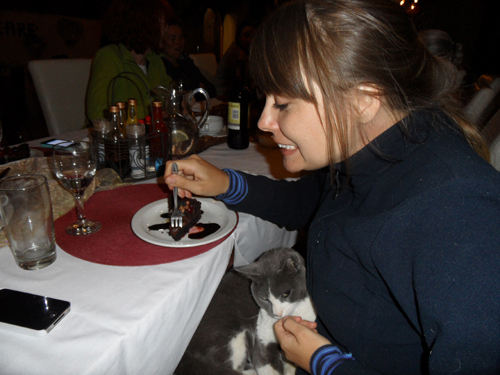 There were cats everywhere. In the restaurant every morning, lunch and dinner. At the bar. By the fire. And at literally every turn we made. 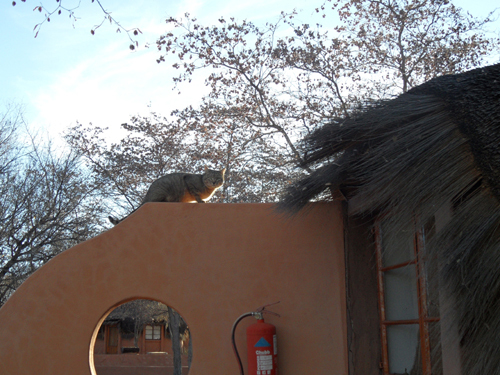 We also had an African wildcat living under the roof of our lodge! The one thing that stood out about them all, was that they were all so healthy, happy and super duper affectionate. There were two cats who as soon as they heard the volunteers calling the mongoose for their feeding, would come running to join them! 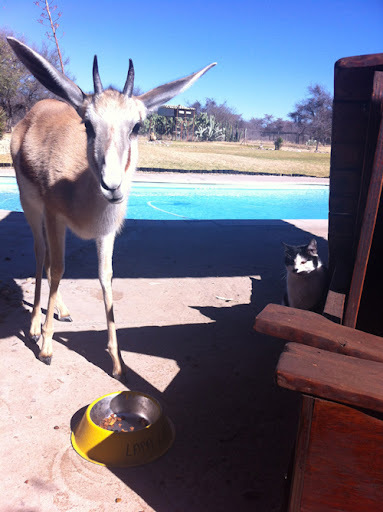 And there was the cat who shared its food bowl with a baby springbok. 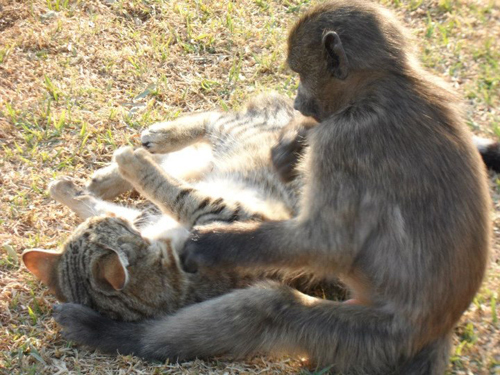 There was the cat who liked to play with Abu the baby baboon. Croc Cat - Spot the crocs in the background! There was the cat we called 'Suicide Cat', because he liked to spend his time sleeping in the crocodile enclosure - with the crocs! 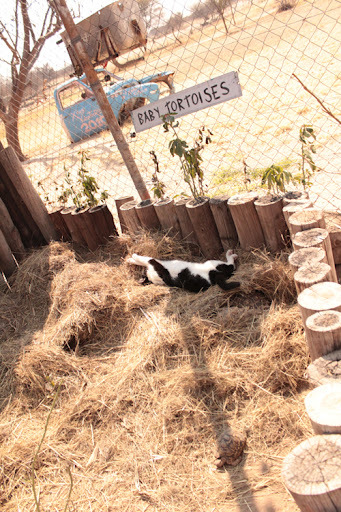 Then there was baby tortoise cat, who slept on top of the baby tortoises - surely to help keep the tiny babies warm? One of my favourite places to walk past was the gym, to visit the lovely gym cats - a very popular hangout! 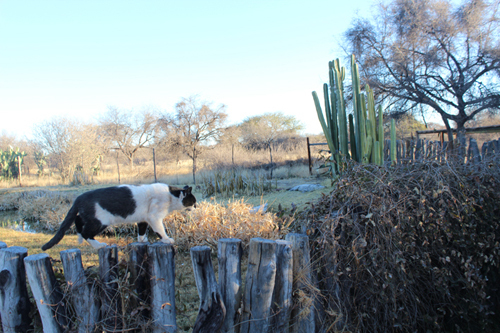 There were cats of all kinds, everywhere. It was awesome! Of course we also got to hang out with amazing wild big and smalls cats too, such as lions, cheetahs, leopards and caracals. Something that was life changing and that I'll never forget! 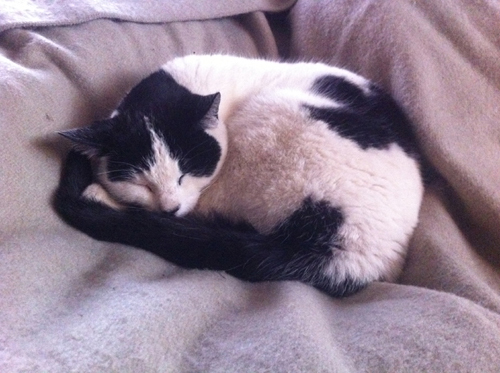 In the end though, the hardest animal to say goodbye to was Spot, our sweet little cat that slept on our bed every night. He was one of the coolest cats I've ever met. I cried many tears when I had to say goodbye and I still think of him every day. For more about my amazing African adventure, check out my blog. Special thanks to Sarah for taking the time to share her amazing story and pictures with us this week! Visit her website to learn about Cat Tee Mission, and click here to read a more in-depth account of her time spent at the sanctuary. So much cuteness! One of my life goals is to pet a big cat and take a photo with them. Good job for Sarah! I admire people like Sarah for having the heart for abused and orphaned African wildlife. This is a wonderful blog in letting the viewers see the beauty of wildlife which others cannot appreciate. With this idea, people like you are contributing in the country’s economic development.